The Italian glass originats from Venice. The glassblowers in 1291 were forced to move to the Italian island of Murano, with the intention tp secure the secrets of glassblowing better. The artists lived like prisoners on the island, making the island known for its glass and how the glass also received its name. In the early twenty-first century it is still the most important glass industry on Murano and the secrets are no longer limited to island. 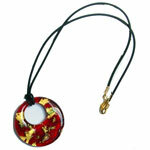 The pendants from our collection are handmade and orginate from Croatia. Croatia is largely known for its Italian influences and it is no surprise that well known glass blowers from the famous island have settled there and have made their secrets public. Alle pendants are unique and one of its kind. That is why there is only one piece of the pendants available.